A Disney Reality – art. college. life. Walt Disney is well known across the globe for his creativity and vision. His name conjures up images of characters that have become lifelong friends, of memorable movies and of theme parks that we want to visit again and again and again. 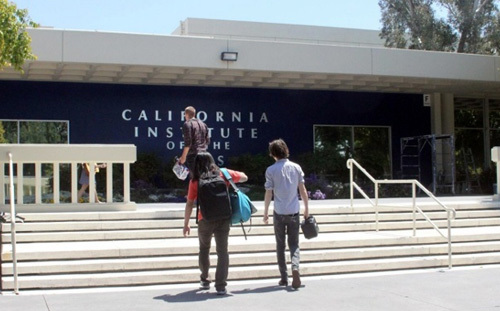 A lesser-known success story of his, one that deserves more attention than it gets, is California Institute of the Arts (CalArts), a small interdisciplinary art school located in Santa Carlita, California, about a half hour north of downtown Los Angeles. In 1961 Walt Disney and his brother Roy founded the institute as the first innovative, interdisciplinary art school in the country, where visual and performing artists would study side by side and collaborate when they wanted. To this day the genius behind the CalArts experiment is still thriving; giving artists the laboratory to learn from each other, integrate their art, and push their own study and medium beyond what is commonplace. Clearly, CalArts is not your typical art school. It’s a fairly intellectual and cerebral place with a focus towards innovation. There are no traditional foundation courses and students are encouraged to take risks. Undergraduates come to campus already knowing how to create art – here they’re challenged to stretch and re-imagine it. The campus houses six separate and rigorous schools: Art, Critical Studies, Dance, Film/Video, Music and Theater. Within the School of Art, theory and art history are incorporated into other coursework. Sophomore year includes independent study, feeling more like a graduate program. Undergraduate coursework leads to a BFA. MFAs and doctorate degrees (Doctor of Musical Arts in the Performer–Composer Program in the Herb Alpert School of Music only) are also available. Application requirements for individual programs include a portfolio of current work along with an artist statement addressing your influences, interests and current artistic direction. Artistic submissions should be personal work not class assignments. High school students need to take their academics seriously, however the school has no minimum GPA. Faculty members are primary decision makers when it comes to accepting applicants into the programs. They want to see what motivates and inspires you, and how you represent those interests artistically. Tuition for the 2013-2014 academic year is $39,976.